It's almost like Pacific Rim "Drifting", but in only one direction for now. If you thought that Drifting or brain syncing in Pacific Rim was science fiction, you are in for a surprise because a group of researchers at the University of Washington has demonstrated that this is actually possible. 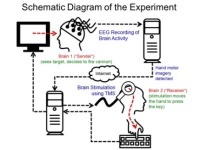 The pilot study of direct brain-to-brain communication in humans was conducted by Rajesh Rao, Andrea Stocco, and a few colleagues. The aim of this experiment was to find out if it is possible to control the brain of a human being via electrical wiring. While it is similar to drifting in the Pacific Rim movie, the difference is that the communication in this case is unidirectional as of now.